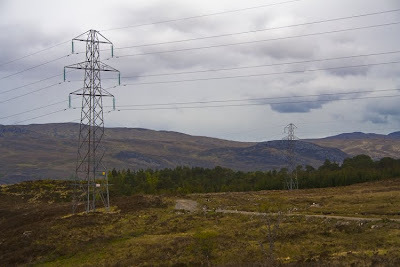 While I was spending a stormy night in the Glen Feshie hills (see last post, A Two Night Camp) the information was leaked to the BBC that the Scottish government will soon approve plans for the upgrade of the Beauly-Denny power line, which will mean giant 200 foot high pylons crossing the Highlands. This hasn’t been confirmed but I will be surprised if this despoliation of the environment isn’t approved despite the 18,000 objections and the public enquiry, whose findings have not been published. The pressure from big power companies for the cheapest and most profitable way to make money (ignoring options for undergrounding, subsea or taking the line down the east coast), aided and abetted by so-called environmental groups like Friends of the Earth and the Green Party who would once have been ashamed to be on the side of big industry, is enormous and the Scottish government will use the spurious excuse that by allowing the industrialisation of the Highlands they are somehow combating climate change. Destroying the earth to save the earth. Back in April 2007 I attended the public enquiry on the day when the witnesses for the Beauly-Denny Landscape Group, a coalition of conservation and environmental groups still concerned with protecting nature, gave their evidence (see my post for April 24, 2007 Victoriana on the Beauly-Denny Line). I felt then that the enquiry was probably a charade and that a decision to approve the line would be made regardless of its findings. The fight is not over however and the Beauly- Landscape Group has put out a strongly worded statement which you can find on the Mountaineering Council of Scotland’s website here and will continue campaigning against the pylons. John Hutchinson, Chair of the John Muir Trust, one of the Beauly-Denny group members, said “Wind, tidal and wave energy may be renewable but Scotland’s precious landscapes are a finite resource”. And this is the point. Pylons will not just destroy the scenic splendour of the landscape but also any sense of wildness or natural environment. Enough of Britain is industrialised already. The little wild land there is left should be restored and protected not destroyed. If these pylons are built it will be a shameful and damaging act of vandalism. Sometimes weather forecasts can be just misleading enough to lure me out in the hope of good weather even though it hasn’t exactly been stated explicitly that this will occur. Add to that being lured into a scenic but exposed high level camp site and all is set for an unintended adventurous and exciting time. Such was the case two days ago when, after days of wind and rain, the forecast suggested a dry day with the possibility of some breaks in the cloud due to a weak ridge of high pressure. I decided on a night out in Glen Feshie, a favourite Cairngorm glen, especially in the autumn when the colours of the woods and the roaring of the red deer stags make it a place of beauty and wildness. I just love lying in the tent in the dark listening to the stags challenging each other across the hillsides and then waking to see the golden sweep of autumn birches amongst the magnificent old Scots pines. It’s a special place. A very special place. By the time I set off the forecast had changed and the good weather window had shrunk to the afternoon and early the next morning. So I set off late, with just four hours of daylight remaining. The rain had stopped but the sky was still overcast. A hint of blue and the clouds rising to reveal the edges of the summits persuaded me to go up rather than along and I climbed up to the vast plateau of the Moine Mhor. The higher tops were in cloud but the moor grasses were a deep rich russet red and the boggy areas still shone green. The colourlessness of winter was still to come. I rounded the edge of the deep defile of Coire Garbhlach, its dark depths and ragged rocks looking grim and foreboding in the dull grey light. From the summit of Mullach Clach a’ Bhlair, just a rounded bump but the highest spot in the south-west corner of the plateau, I began my descent back into Glen Feshie down the Druim nam Bo ridge, hurrying now as dusk was creeping up on me. The dark pool of Lochan nam Bo appeared, set in a low cleft in the hillside. Beyond the lochan I knew the terrain dropped away steeply in rough slopes of rocks, bog and thick vegetation. An old little-used stalkers path zigzags down this hillside and then through the woods to the glen floor. Finding and following this path could be difficult in the dark. There was good dry and flat ground near the lochan. The decision was made and I pitched the tent. Dinner over and warm and comfortable I lay down to sleep. A gentle breeze caressed the tent. An hour later I was woken by the roaring of the wind and the drumming of the tent fabric. I lay and listened to the storm. A corner of the tent sagged a little. Looking out I saw a peg had come loose and a guyline was thrashing in the wind. 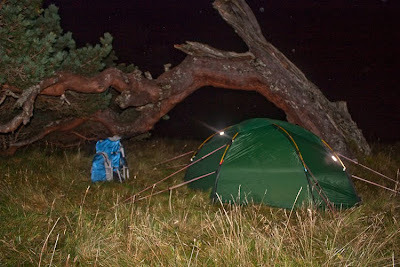 A quick and chilly dash outside – the temperature was 3.5ºC – and the tent was stable again. For another hour I dozed and woke, dozed and woke. The wind was strengthening and the billowing of the tent was moving the air inside, causing the thin shell of my quilt to move against me. I had no concerns about the tent collapsing - it was a winter mountain model after all – but realising that I was unlikely to sleep much and with six hours until dawn I decided I’d rather be walking so I packed up camp and headed into the black night. The descent was intense and committing yet also felt slightly unreal. Without the headlamp I could see nothing. A compass bearing took me to the path, which I then found and lost many times, guessing where it might go, missing turns then hitting it lower down. I stumbled into holes and over rocks. Without my trekking poles I’d have fallen several times. Then the first trees appeared and the path became more defined though still rough and knee deep in heather. At one point three pale skeletal dead pines were picked out by my headlamp beam, an eerie sight as nothing else was visible. Finally the slopes eased and I was out on the grassland in the wide glen with the roar of the river in the distance and giant gnarled pines looming up all around. The descent had taken hours in my mind but when I checked my watch it was just an hour and forty minutes since I’d left camp. A half-dead old pine provided some shelter from the wind, less forceful down here but still gusty, for the second camp of the night. Drizzle was drifting down and everything was damp. Finally at 3.30 a.m. I fell back to sleep. Four hours later heavy rain hammering on the tent woke me. The storm blew me back down the glen to the car. The path was running with water in places, the River Feshie a savage tumult of deafening, crashing water. Three streams cut across the path, all swollen with rain, none bridged. The first was braided and I skipped from rock to tiny grass islet to tussock and kept my feet dry. But the Allt Garbhlach was an unbroken furious whitewater torrent, rushing down out of the corrie high above. Crossing safely became the issue, not keeping my feet dry. It took time to find a reasonable looking spot for a ford. Then careful footing on slippery rocks, hanging onto the trekking poles and a lurch from knee deep water to the bank saw me across. The last stream was nearly as deep but not as strong. With relief I reached the car, just twenty- two hours after leaving it. And then as a final flourish from the weather the drive home was difficult with large pools on the roads, heavy spray from other vehicles and lashing rain. Four days of low cloud, rain and a general gloom that made it dark at midday hasn’t encouraged ventures outdoors. The hills have been invisible, the air thick and grey. 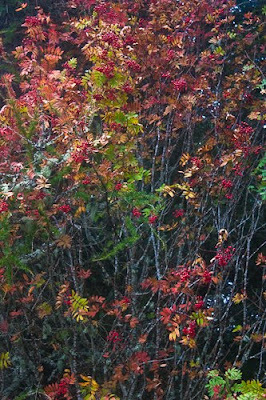 Even the autumn trees have seemed subdued. The rain fell thinly and steadily then became heavier and heavier, pounding on the windows and running down the garden path in rivulets. Finally it eased, just spitting lightly hour after hour. Thick clouds still swept over the sodden landscape from the south-east though. Then just as the day was ending the dull blanket of clouds began to break and shafts of light slid through. At first there was just a hint of brightness, a touch of pink on a cloud, a yellow beam of light. 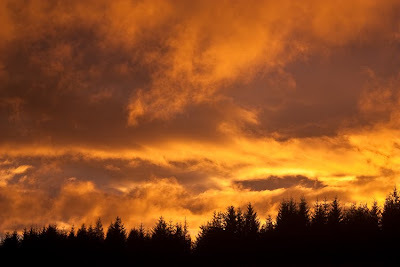 Then suddenly the sky was alight with swirling clouds turned yellow and orange by the sinking sun. A curving pink band of cloud hung over the Cromdale hills, edged by a tall slice of rainbow. In the west above the dark forest a firestorm raged. 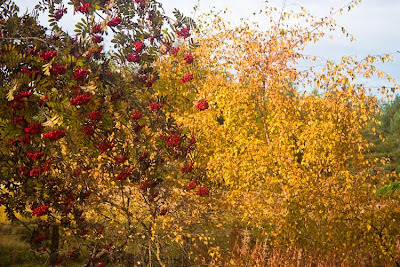 The birches and rowans were now rich and deep with glowing red and gold colours. Venturing out I strode across the fields marvelling at the swift change in the light, the sudden return of colour and brightness even as the night closed in. The magic only last half an hour but to be out in it, surrounded by that amazing sky, was a wonderful experience. A few days ago I was sitting on the train watching the autumn colours of the Strathspey woods slide past the windows and feeling relaxed with a day of views, reading, talking and buffet cars ahead of me. 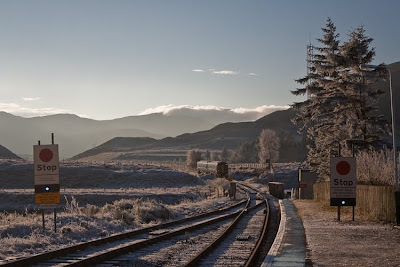 As the woods gave way to moorland and misty hills and the train began the climb up to the Drumochter Pass I thought how much I relish train travel, how enjoyable it feels compared with the stress of journeys by car, whether as driver or passenger. There is a freedom in train travel that just isn’t there when confined to a tiny metal box hurtling along in a mass of other harassed tin cans. Train travel is civilised, in fact. Train travel does not require attention to be given to the mechanics of travel or the behaviour of those controlling other vehicles. On trains you can think, contemplate, imagine, learn. After a car journey of a couple of hours or more I need some time to recover and adapt. After a train journey I am ready for whatever comes next. And that’s despite the appallingly mismanaged mess that is the British railway system; though it barely deserves the last word, being a hotchpotch of inefficient competing and interlinked companies that resulted from the botched privatisation of the last Tory government. British Rail was far better than the current shambles even though it was in decline due to years of under investment by uninterested governments. A return to a single nationalised company is the only way to have an efficient railway run as a public service rather than to make money but I can’t see any of today’s unimaginative, managerial, blinkered politicians even contemplating this. There is a Facebook Bring Back British Rail campaign, which I welcome though I can’t see it achieving its aim any time soon. Train journeys feel part of my backpacking and hiking in a way that cars don’t, even though I travel by car more often these days, at least in the Scottish Highlands. Once, though, all my walks started with a train journey – to Windermere for the Lake District, the North Wales coast for Snowdonia, Edale for the Dark Peak and north into the Highlands for the Cairngorms, Torridon, Knoydart, Arrochar and more. Using trains there’s no need to return to a start point so they are ideal for through routes. There’s time to watch the landscape and the wilds too. Looking at the beautiful woods alongside Loch Lomond and then sweeping across the open lochan-dotted expanse of Rannoch Moor en route to Fort William and Ben Nevis. And on from the Fort beside the golden sands of Arisaig and Morar to Mallaig and the ferry to Inverie and Knoydart. Wonderful journeys! Sometimes alighting at lonely Corrour station and walking through to Glen Nevis and Fort William or across the hills to Dalwhinnie station. There are many options, many possible adventures. Other countries, other trains. One of my favourite train journeys is that overnight from Stockholm north to Arctic Sweden. The big wallowing train lumbers out through the suburbs, past factories and houses and industry, as you settle down to sleep. Then morning comes with a vista of vast conifer forests and distant snow-capped hills. During the night the world has changed and is suddenly magical. Several years ago I caught the train south through the Channel Tunnel and on across France to the Queyras Alps. I left the train at dawn and walked up into the hills from the station. Two weeks later I walked back down again and caught the train home. Once in the USA, not the ideal country for train travel, I caught the California Zephyr from Salt Lake City to Martinez in California across deserts, mountains and rich farmland. In Martinez I visited John Muir’s house then caught more trains to San Francisco and Merced, where a bus took me to Yosemite National Park. I think we need more trains. 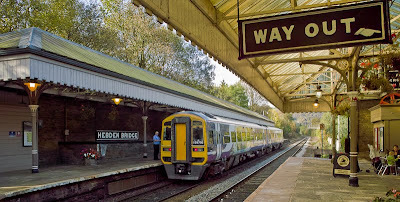 Bottom - Hebden Bridge station. Sigma DP1, 1/80@f5.6, ISO 100, raw file converted to JPEG in Lightroom 2.5. “Season of mists and mellow fruitfulness”. But soon enough the autumn will fade and winter will come in force. The sun may be warm but in the shade there’s a chill in the air and the nights threaten frost. To the south the distant mountains are dark, etched against the pale sky. The early snow has gone. Soon it will return. Back in the spring (see post for May 9, 2009) I reviewed Jerry Coyne’s excellent Why Evolution Is True, a book that runs through all the strands of evidence for evolution. Last month Richard Dawkin’s book on the same theme, The Greatest Show On Earth: The Evidence For Evolution, was published. This is a much bigger book than Coyne’s and illustrated with 32 colour pages. 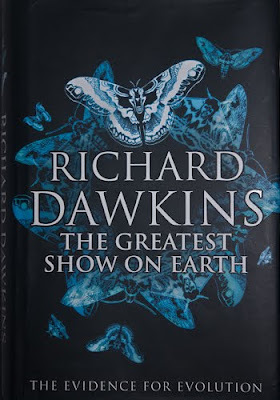 Whilst it covers the same ground Dawkins presents the material in a very different way with different examples and has a very different, more literary style with more digressions and anecdotes. There’s much more detail and information too. Early on Dawkins demolishes the idea that because it’s called the theory of evolution it isn’t proven and the rest of the book is about showing why it’s a fact. (As an aside, I’m not sure about his invention of the word theorum as a substitute for theory to avoid confusion with the non-scientific meaning of the latter as speculation or conjecture). Dawkins then goes on to discuss the gene pool and artificial selection (a nod to Darwin who began The Origin of Species with artificial selection); macro-evolution; natural selection; the measurement of time by tree rings, radioactive clocks and carbon dating; evolution in the laboratory (I was fascinated by the description of a long-term experiment with bacteria that shows evolution in action); the fossil record; human evolution; embryology; biogeography (with praise for Jerry Coyne for a “masterful treatment” of this in Why Evolution Is True); molecular biology, vestigial traits and much, much more. I found the book fascinating, satisfying and enriching as I think would anyone interested in natural history and how life evolved. Richard Dawkins being a hugely successful writer and a somewhat controversial figure The Greatest Show On Earth has been extensively reviewed. I read many of these reviews before reading the book and again after reading it. With a few exceptions the impression I gained was of reviewers who had at most skimmed through the book, looking mainly for attacks on creationists, and then reviewed it based on their opinion of the author and his anti-religion book The God Delusion. Few discussed the book they were meant to be reviewing in any depth or detail. Some appeared not to understand what it was about or why it had been written. Happily, such is Dawkins popularity (which in itself seems to annoy some reviewers) the book has been a great success, which it deserves. How does it compare with Why Evolution Is True and which one would I recommend to someone wanting to learn about evolution? Well, I’d recommend both! But to a complete novice with no knowledge of biology or natural history I would suggest reading Jerry Coyne first as his book is more succinct and the information is more simply presented. I can imagine the Dawkins being a little daunting if it was the first book on the subject someone had ever picked up. But it should certainly be read next, to provide more information and detail and just because it is a beautifully written and wonderful book. Richard Dawkins has an interesting website with an active, entertaining and informative forum. Many of the reviews of the book I found on this website. Glen Feshie is one of my favourite glens in the Cairngorms with wonderful old pine forest sandwiched between steep slopes, craggy in places, and the braided river Feshie rushing through the trees. The Feshie is fierce and fast with many gravel banks and channels. After heavy rain it rises rapidly and becomes a powerful torrent. There are only a few bridges across the Feshie and one of these has now gone. 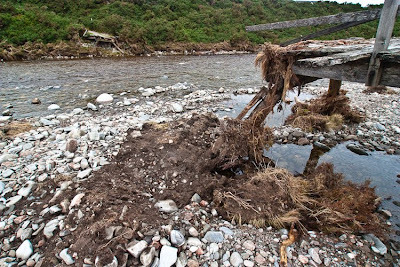 The Carnachuin Bridge, a wide wooden structure, was swept away by a huge flood on September 3, as reported by the Mountaineering Council of Scotland and Walk Highlands (with a dramatic photo taken by an estate worker during the flood). This bridge was regularly used by walkers and mountain bikers who had come along the estate road on the west side of the glen. Viewing the remains of the bridge a month after it had been swept away and with the Feshie in more subdued mood I felt a mixture of sadness and awe. Sadness because I had often crossed the old rickety bridge with its missing planks and twisted shape and have many memories of it, awe because of the power required to destroy the bridge, which stood many feet above the river when the latter was at normal height. The bridge was quite decrepit and there had been warning notices on it for many years so it was going to collapse eventually unless repaired but I don’t think anyone had expected it to go in such a spectacular way. The estate has said a new bridge should be erected in May or June next year. Turning away from the shattered remnants of the bridge I climbed the slopes above to rolling Mullach Clach a’Bhlair, a big, bulky Munro. A walker was just leaving the summit. He’d walked down Glen Feshie to the Carnachuin Bridge, not knowing it was no longer there, after crossing the Feshie by the pony bridge 2.8 kilometres lower down the glen (a popular route as the road can be used on the east side rather than narrow footpaths on the west side). Finding the bridge gone he’d then walked back to the pony bridge and down the glen on the other side, adding 5.6 kilometres to his walk. He said there was a sign about the Carnachuin Bridge above the first bridge but he’d only seen it on his way back. Really there should be signs at the Glen Feshie car park and on the western side of the pony bridge. Photo info: The remains of the Carnachuin Bridge. Canon EOS 450D, Tamron 11-18@11mm, 1/200 @ f5.6, ISO 200, raw file converted to JPEG in Lightroom 2.4. The first of the big autumn storms arrived two days ago, bringing rain at lower levels along with fierce winds. I never caught a glimpse of the mountains but a brief report on the Mountaineering Council of Scotland website described a light dusting of snow on Cairn Gorm and Braeriach. Yesterday the storm raged on, making the drive south to give a talk at the East Perthshire Walking Festival difficult at times as the wind tried to blow the car off the road and lorries sent huge waves of spray lashing across the windscreen. Again I didn’t see the hills. Those who were on them reported extreme conditions. In a comment on my October 2 AWalk In the Early Autumn Woods post Mike Fae Dundee said he had to crawl the last 100 metres to the summit of Bynack More, so strong was the wind. The Cairngorm Weather Station recorded a gust of 105mph in the middle of the day. Today was calmer with sunshine to the east of the cloud-shrouded mountains. I spent the afternoon outside cutting firewood. I can see the Cairngorms from my garden and several times the clouds rose above the summits revealing a coating of snow on their flanks. The snow doesn’t look very thick but more big storms bringing more snow are forecast for later in the week. It’s time to change my thinking about the hills and to prepare for cold and snow and wintery conditions. 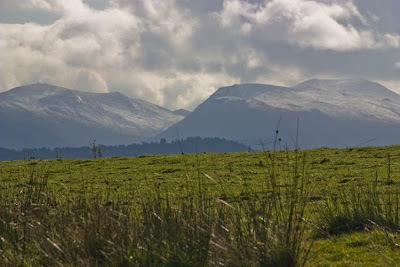 Photo info: Fresh snow on Cairn Gorm and Bynack More, viewed across Strathspey. Canon EOS 450D, Canon EF-S 55-250 IS@250mm, 1/800 @ f16, ISO 400, raw file converted to JPEG in Lightroom 2.4. In the November TGO, just published, my backpacking column is about the pleasures of hiking off trail. In the gear section I review base layers, just in time for the winter, and a Furtech jacket and trousers, also good for cold weather. Also in this issue is a very interesting piece on making your own gear by John Manning that includes an interview with Colin Ibbotson and his homemade ultralight gear (see my post for July 14 – Ultralight in the Cairngorms). A page is devoted to Colin’s unique Skins pack. Also on gear Eddy Meechan looks at bivy bag/tarp combinations in his Lighten Up column, Judy Armstrong reviews multi-tools and Clive Tully worries about whether we might lose GPS signals in the next few years. Away from gear there are interesting looking articles (I’ve read none of them yet) on epic hill runner Lizzy Hawker, who holds the record for running from Everest Base Camp to Kathmandu – just over 3 days!, by Ed Douglas; an attempt on the Greater Cuillin Traverse, endearingly entitled Nutters on the Cuillin; a return to Stanage Edge; Tony Howard and Di Taylor exploring Jordan; Cameron McNeish on Ben Loyal and a plea to save the wildcat by Peter Cairns. Photo info: Off trail in the Sonoran Desert in Arizona. Ricoh RDC-5000. 1/180@f13. Interestingly, one of the pictures used to illustrate my backpacking column was taken with the same 2.3mp camera on the same trip. It’s only a 729kb image but looks okay printed at 12x7cm though it definitely has a more artificial “digital” look than the two accompanying 4 and 5mb images taken with a DSLR.